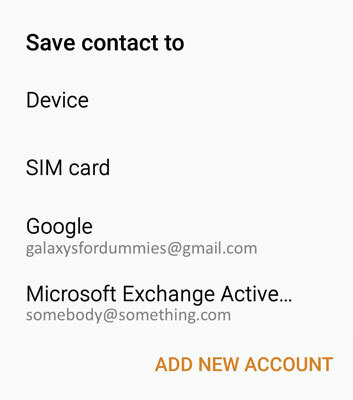 It is important for you to decide the default option where you want to store your contacts on the Galaxy S6. Deciding this now with the information provided you will make your life much easier as you go forward. It is possible to combine contact databases, but even the best tools are imperfect. The first time you try to save a new contact, the Contacts app will offer you a pop-up screen as seen here. This lists the options you have and will take your first entry as the option you want as a default. Choosing a default for creating new contacts. Each of these four options has advantages and disadvantages. Here is the deal: If everything is working properly, all options work equally well. However, if you switch phones regularly, ever lose you phone, need to make significant updates to your contacts, or are frequently out of wireless coverage, such as on an airplane, you should consider the options. The first option mentioned involves storing your contacts within your phone. This is a great option, as long as you have your phone. However, there will come a day when Samsung (or HTC, or LG, etc.) has something faster and better and you will want to upgrade. At that point, perhaps next year or in ten years, you will need to move your contacts to another location if you want to keep them. Plus, if you lose your phone, you need to have recently used one of the back-up options. The second option is to store your new contacts on your SIM card. The SIM card is familiar technology if your previous phone worked with AT&T or T-Mobile. 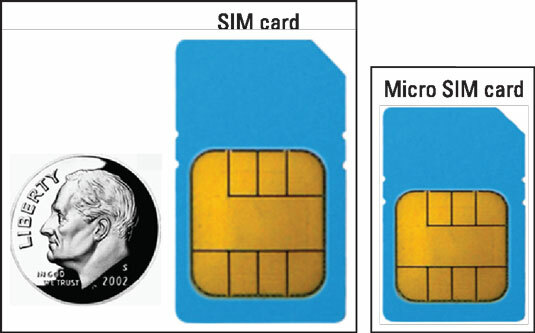 The following figure shows a profile of a typical SIM card, next to a dime for scale, although yours probably has the logo of your cellular carrier nicely printed on the card. To the right of the SIM card is the newer micro SIM card. This is the same idea, but in a smaller package. A SIM card and a micro SIM card. If your cellular carrier is Verizon, Sprint, or U.S. Cellular, you may be confused. Your Galaxy S6 has a SIM card. What’s the story? These carriers use CDMA technology for voice and for some data features. Up to 3G, the phones using CDMA technology and data services didn’t use a SIM card. Today, all carriers in the United States are implementing a super high-speed data technology called LTE, also called 4G. Because your phone is capable of LTE, you now have a SIM card. The cool aspect of using your SIM card is that you can pluck it out of your existing phone and pop it in another phone and all your contacts come with you. It works this easily if you stay with an Android smartphone of recent vintage. It almost works this easily if you, say, switch back to a feature phone (as in the kind of phone that merely makes calls and texts). Another advantage is that your SIM card does not rely on having a wireless connection to update changes. The next option is to store new contacts on your Gmail account. What this means is that your new contacts are automatically copied from your phone to the Gmail account of Google servers. This keeps the records on your phone, but Google maintains a copy of this record in your Gmail account. You can make changes to a contact on your phone or on your PC. Two reasons to use your Gmail account are: 1) you can maintain these records with your full-sized keyboard, rather than the smaller keyboard on your phone; and 2) it is easy to get back all these contacts on a new Android phone simply by telling the new phone your Gmail account. Because you will probably enter your Gmail account right away when you get a new phone, your contacts reappear quicker than the fourth option. The fourth option is to store the contacts in one of your existing e-mail accounts. This may be the best option if you already consider your e-mail, either your personal or work account, to be the primary location where you store contacts. If you already have good database discipline with one of your e-mail accounts, by all means, use this e-mail account as the default place to store new contacts. If this particular account you currently use for keeping your contacts is not set up yet on your phone, you can tap the “Add New Account” hyperlink to go through the process of setting up a new e-mail account.